Just a 20min walk from the Gandhara Castle Resort, Masjid Rajgan is located on the edge of Khanpur Dam reservoir. 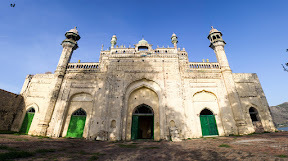 The historical Masjid was built by Raja Sultan Jehandad Khan in 1872. The structure of the Masjid is still in good shape but at the same time it is neglected and abandoned by the local people. “People occasionally gather here for Eid prayers, but it is not in daily use.” Locals explained. June 21, 2016, 6:18 a.m.